In my last post, I explained the origins of the BREXIT vote, the inability for pollsters to forecast the Leave Campaign’s surprising victory, the regional distribution of the vote and the potential impact BREXIT could have on the United Kingdom’s future territorial unity. In this post, I want to breakdown the BREXIT vote along demographic lines. The goal is to understand who supported BREXIT and who wanted Britain to remain in the European Union (EU). In the event, the British Parliament considers to hold a second referendum, which at this time is very unlikely, these numbers will help each side of the debate mobilize their supporters. As noted yesterday, 72% of the British electorate participated in the BREXIT referendum. Let us first look at the participation rate by age group. How did voters in each group vote? 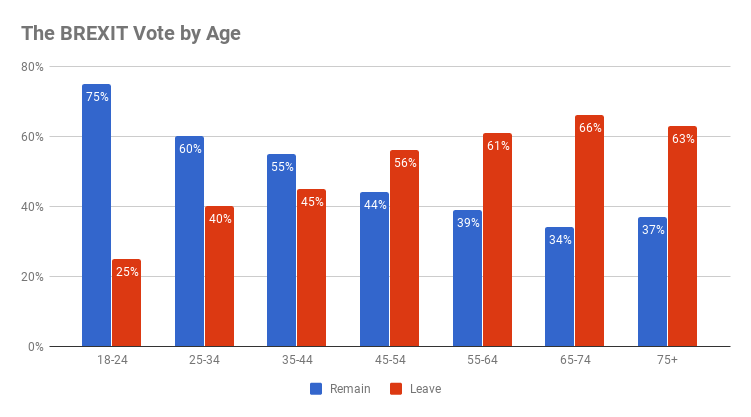 Clearly, younger voters were more supportive of the Remain Campaign than the Leave Campaign. 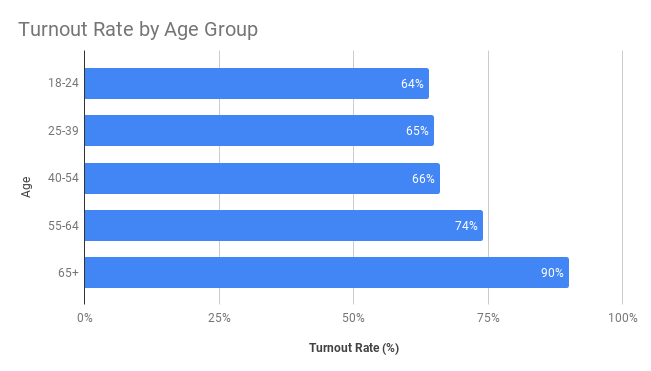 Given higher turnout rates among older voters, they helped the Leave Campaign win the referendum. This generational divide is a bit daunting for the UK’s future. As it starts to recast its economic future, the risks associated with this move will impact younger people more than older voters. It is worth highlighting that 75% of voters between the ages of 18-24 voted for the UK to remain in the EU. That is a big margin. Here is a table that summarizes the results of the vote along gender lines. Men participated at higher rate than women and they overwhelmingly voted to leave the EU. Women had mixed views on the EU. Immigration issues was one of the big drivers of the BREXIT vote. For those voters who felt that the UK should regain control over its border and immigration policies, BREXIT was seen an important step. Those people who favored the EU’s open borders and its labor mobility regulations voted to stay. I will write about this in post in the future. But the debate on immigration activated identity politics. The next table captures an important racial divide regarding BREXIT. 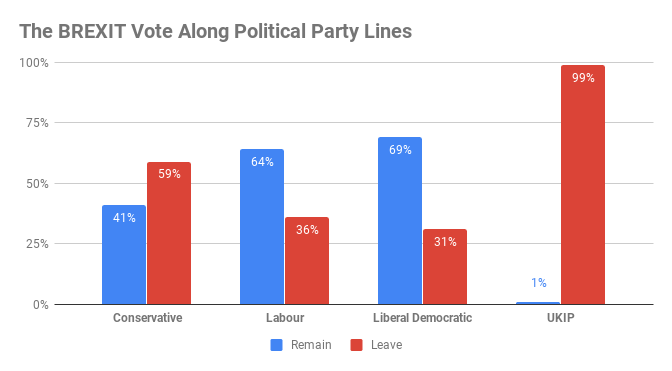 It is clear that White British voters overwhelmingly supported the Leave Campaign, while minority voters strongly voted for the Remain Campaign. Could a higher turnout rate among minority voters help keep the UK in the EU? The number of minority voters in the UK, compared with the United States, is very small. Thus, a higher participation would not have made a big difference. To measure voters’ social class status, we can use a voter’s type of employment as a proxy. 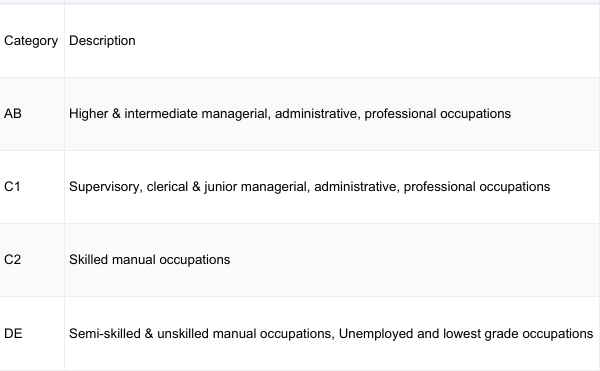 The British Census includes four key classifications. Let us look first at the turnout rate for each of these classifications. 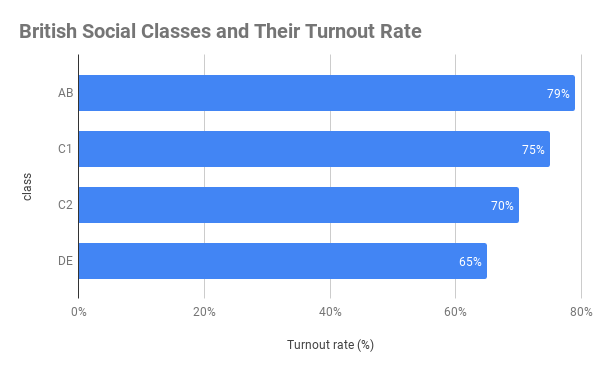 While the turnout rate among the highest classes was higher than the national average, the fact of the matter is that these voters represent a smaller size of the electorate. By in large, voters in higher income professions were more apt to support the Remain Campaign than people in lower-paid professions, as the next graph demonstrates. In terms of voters’ educational background, the turnout rate for voters with the U.S. equivalent of a high school education or less (i.e. “no qualifications”) was estimated at 70%, while it stood at 71% for voters with some tertiary education. The rate for voters who completed a university degree or higher was 78%. 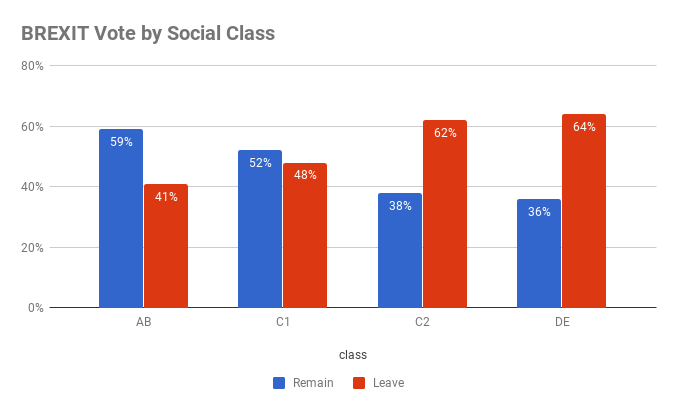 The next table summarizes the distribution of BREXIT votes along these three groups. 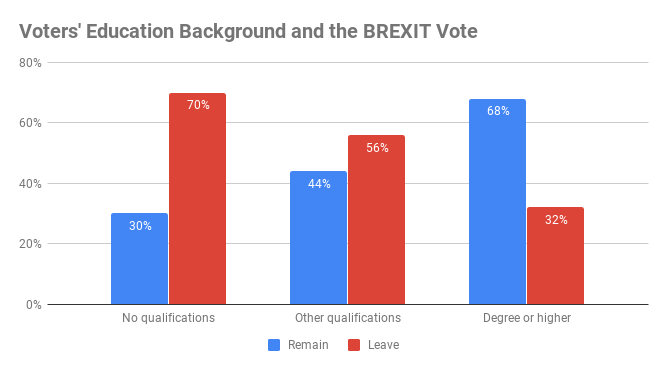 The higher voters’ education attainment, the more critical they are about BREXIT. Finally, let us look if voters’ affiliations to Britain’s main, national political parties had any impact on their vote in the referendum. Even though the UK Independence Party is not a major political party and it has a very low number of follower, when compared to the other parties included in the graph above, it is worth remembering that its leader, Nigel Farange was one of the main leaders of the Leave Campaign. It is impressive that close to 100% of its voters want Britain to exit the EU. Support for Brexit was stronger in the Conservative Party than in the Labour Party and Liberal Democratic Party. Not surprisingly, the turnout rate for people affiliated to one of the main political parties was higher than the national average. As Britain gets closer to its expected departure from the EU, it is worth remembering that many Britons voted in favor of remaining in the EU. Should the British parliament consider a new referendum? For now, the House of Commons has rejected proposals to hold a new referendum. But assuming that the members of parliament had a change of hearts, would voters change their vote? It is difficult to answer these questions. BREXIT divided the public and these divisions will define British politics for some time.